A Con Ed employee who fatally struck a Manhattan senior and was found guilty of careless driving had his license revoked for one month by the New York State Department of Motor Vehicles. 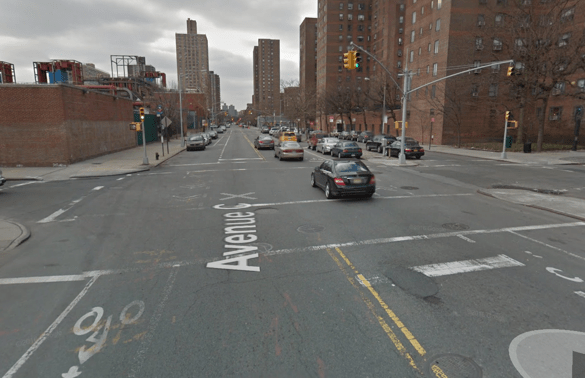 Andrew Franco hit 88-year-old Stella Huang with a Con Ed truck while making a left turn at Avenue C and E. 16th Street. The crash occurred at around 5:15 p.m. on November 27, 2013, a day when New York City motorists killed four pedestrians and one cyclist. In New York State, a license revocation means a motorist may apply to have his driving privileges reinstated after a prescribed period of time, which is normally a minimum of six months. Though according to the Daily News Franco was found guilty of failing to exercise due care — which likely means Huang was walking with the right of way when he killed her — the DMV deemed Franco eligible to get his license back after one month. The News reports that Franco filed a lawsuit because the DMV isn’t processing his application for reinstatement quickly enough. Franco’s lawyer, Michael McNulty, says the delay is “shocking to the conscience,” particularly since Franco has a good record and needs the license to work. He is asking the court to reduce the penalty to a suspension so Franco’s license could be reinstated immediately. When a license is revoked, the DMV may or may not decide to restore driving privileges. A revocation is more severe than a suspension, which allows a driver to get his license back after a certain period of time simply by paying a fee. Essentially, then, Franco’s attorney is arguing that since the DMV could not make a reinstatement determination at the end of one month, the revocation for killing a person while failing to exercise due care should be invalidated. We’ve asked Con Ed if Franco continued to drive a truck for the company after he killed Stella Huang and was found guilty of careless driving, and if he may keep driving for Con Ed if he gets his license back. We also asked for info on Con Ed’s driver safety protocols. We’ll update this post if we get an answer. Editor’s note: This post was edited after publication. This is like when Giuliani says over and over that there were no major terrorist attacks under George W Bush. I’m sure Franco will not drive without a license. That’s not what it means to fail to exercise due care. Motorists are required to exercise due care even to avoid colliding with pedestrians who are in the wrong. If Huang indeed was crossing with the signal, and therefore Franco was required by law to yield, why wasn’t he found guilty for failure to yield as well as for failure to exercise due care? Nice wide open intersection, no need for any design changes here. Nothing that could be done with an additional $50 million from the City Council. You’re right. That’s not what it means. But in practice, if NYPD has ever charged a motorist with failure to use due care after hitting a person who was not crossing with the right of way, I’ve never seen it. Often a driver will be charged with multiple offenses but will be found guilty only of the “top” charge. But I don’t know that that’s what happened here. Court records are not online now, if they ever were. At any rate, copy amended. Well, NYPD is a violent lawless crime gang. Some of the cops in real police departments in the rest of the state do occassionally arrest motorists for killing jaywalkers. I think DMV can be reformed; I think failing to revoke licenses is just habit with DMV, and the judges seem properly disturbed by how easy it is for reckless killer drivers to get back on the road. NYPD seems hoplessly corrupt and is actively on the side of the killers. Franco’s actions are shoking to the conscience and Franco has a record as a careless, reckless killer, which is what should be pointed out. Over the last few years, advocates have called for standardized practices from DMV to suspend or revoke the licenses of drivers whose recklessness behind the wheel leads to serious injury or death. But a review of recent hearings after fatal crashes reveals no apparent rhyme or reason to the penalties for deadly driving meted out by DMV.